The new, fast, Batch Extractor, extracts your SketchUp Geometry directly inside of the IRender Batch window, rather than inside SketchUp using Ruby. It is currently available in Beta Test mode in the latest versions of IRender nXt , ArielVision and 3D Design Studio which you can download here Downloads Page. Your rendering times, (after extraction), will be the same. But the Batch Extractor can greatly improve the time spent before the rendering passes start. 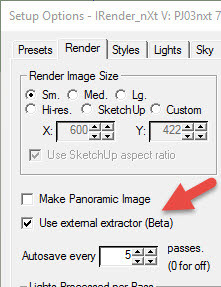 After downloading the latest version of the SketchUp Extension, bring up the Render Setup Tab, and check "Use external extractor"